Iran’s President Ahmadinejad reacted to Venezuelan President Hugo Chavez’s death by calling him a “martyr” who fell to a “suspect illness”. Iran declared a day of national mourning. Chavez's death marks the end of the long “love affair” between the two champions of anti-Americanism. Ahmadinejad is also soon to leave the political arena after Iran's June 2013 presidential elections. Since Ahmadinejad’s ascendancy to power in 2005, the cornerstone of his Latin America policy has been the formation of an anti-American axis with Venezuela. During a July 2006 visit to Tehran, Chavez told a Tehran University crowd, "We have to save humankind and put an end to the U.S. empire." During his visit to Tehran a year later, Chavez and Ahmadinejad declared the formation of an "Axis of Unity" against the United States. Kavon Hakimzadeh, a U.S. military official, called their alliance an “Axis of Annoyance,” based on their common need to avoid isolation and their similar unpredictable personalities. Most importantly for Iran, Chavez emerged as the go-between and relationship manager for Iran’s entree into Latin America, by encouraging and materially helping Ahmadinejad’s embrace of the Bolivarian revolutionary leaders of Bolivia, Ecuador and Nicaragua, in an effort to "unite the Persian Gulf and the Caribbean." The symbiotic relationship between Chavez and Ahmadinejad was also grounded on their visceral anti-Semitism. The Holocaust denial and anti-Semitism of Iran’s president were widely exposed in the public statements that emerged from their meetings. Although acclaimed as a “socialist” leader, what is less-known and generally hidden from the public eye were the fascist influences on Chavez’s worldview and policy. Shortly after ending his incarceration resulting from his failed 1992 military coup, Chávez had made contact with an Argentine neo-fascist sociologist, the late Norberto Ceresole, a Holocaust denier, a sworn enemy of both Israel and of Jews. Ceresole had strong ties with the Iranian regime and admired Hezbollah. He accused the Jews and the Israeli secret services for the bombing of the Jewish AMIA building in Buenos Aires in 1994. During Israel's 2009 Operation Cast Lead against Hamas bombing of Israeli territory and its continuous terrorist activity against its citizens, Chavez embraced completely Iran's position and complied with Ahmadinejad's demand to severe Venezuela's diplomatic relations with Israel. 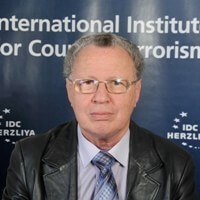 In a much-publicized interview with American journalist Jeffrey Goldberg in 2010, Fidel Castro criticized Ahmadinejad for denying the Holocaust and said the Iranian government should understand the consequences of anti-Semitism. In the days before Castro’s remark, Chávez had faced growing criticism by Venezuelan Jewish leaders for verbal attacks against Venezuelan Jews both by him and by members of his United Socialist Party of Venezuela (PSUV), as well as his tacit encouragement of the anti-Semitic vandalism of a synagogue and an attack on a Jewish community center in Caracas in 2009. Significantly, the day after Castro’s comments, Chavez released a statement, saying that “we respect and love the Jewish people”. The interim president of Venezuela, Nicolás Maduro, and probable future president, has begun the post-Chavez era by orchestrating a crisis with the U.S., by expelling American diplomats, accusing the U.S. of poisoning Chavez and calling the domestic opposition fascists. It is not clear if the Chavista regime will survive its leader in the long run. The disappearance of Chavez’s dictatorial friends in the Middle East - Muammar Qaddafi and possibly Bashar al-Assad - and the weakening of Iran and Hezbollah in the regional arena, could convince the new leadership in Caracas that Chavez’s infatuation with the Tehran ayatollahs is counter-productive for the interests of Venezuela.